248 pages | 26 Color Illus. | 74 B/W Illus. 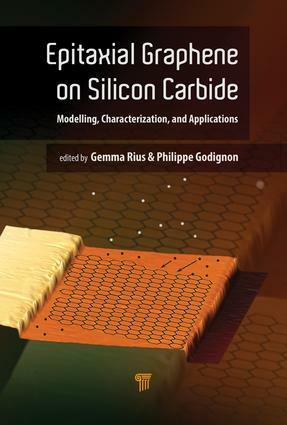 This is the first book dedicated exclusively to epitaxial graphene on silicon carbide (EG-SiC). It comprehensively addresses all fundamental aspects relevant for the study and technology development of EG materials and their applications, using quantum Hall effect studies and probe techniques such as scanning tunneling microscopy and atomic resolution imaging based on transmission electron microscopy. It presents the state of the art of the synthesis of EG-SiC and profusely explains it as a function of SiC substrate characteristics such as polytype, polarity, and wafer cut as well as the in situ and ex situ conditioning techniques, including H2 pre-deposition annealing and chemical mechanical polishing. It also describes growth studies, including the most popular characterization techniques, such as ultrahigh-vacuum, partial-pressure, or graphite-cap sublimation techniques, for high-quality controlled deposition. The book includes relevant examples on synthesis and characterization techniques as well as device fabrication processing and performance and complements them with theoretical modeling and simulation studies, which are helpful in the fundamental comprehension of EG-SiC substrates and their potential use in electronic applications. It addresses the fundamental aspects of EG-SiC using quantum Hall effect studies as well as probe techniques, such as scanning tunneling microscopy or atomic resolution imaging based on transmission electron microscopy. It comprises chapters that present reviews and vision on the current state of the art of experts in physics, electronic engineering, materials science, and nanotechnology from Europe and Asia. Gemma Rius is a Beatriu de Pinós postdoctoral fellow at the Institute of Microelectronics of Barcelona-National Center of Microelectronics (IMB-CNM) of the Spanish National Research Council (Superior Council for Scientific Research, CSIC) since 2015. She graduated in physics from the Autonomous University of Barcelona, Spain. From 2002 to 2008, she was a nanolithography engineer and PhD student at IMB-CNM, CSIC. She ws a postdoctoral researcher at Tohoku University and Toyota Technological Institute in Japan. She then joined Nagoya Institute of Technology, Japan, as assistant professor. She has been mainly working on nanostructuring of 2D materials and has been involved in carbon nanomaterials, such as graphene, for more than 12 years. Philippe Godignon is a professor of electronic engineering, aerospace engineering, and physical chemistry at IMB-CNM. He received his PhD in electrical engineering in 1993 from the National Institute of Applied Sciences in Lyon, France. Since 1990, he has been working with the Power Devices and Systems group of IMB-CNM on Si and SiC semiconductor device design and technologies. More recently, he has also been working on the synthesis and processing of carbon-based materials (carbon nanotubes, graphene, and polymers) for nanotechnologies and biosensors. He is co-author of more than 235 publications in international journals and numerous presentation for conferences and holds 16 patents. He also participated in the creation of two companies, Graphene Nanotech S. L., Spain, and CALY Technologies, France.